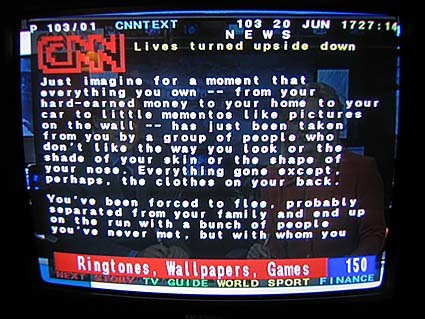 The news headlines on page 101 of CNN International teletext here in the Netherlands sometimes don’t make any sense. It seems that they are just grabbed from cnn.com and stop whenever the space on the page runs out. Have a look at this strange and unclear story that was one of their leading teletext stories this week. And that’s all. There is no second page or anything. How can CNN just put this on their headlines on teletext? Can they not at least put a final line on that says something like “Continue reading on CNN.com” or something like that? This entry was posted on Friday, June 23rd, 2006 at 3:13 am CET and is filed under Pop culture	with tags . You can follow any responses to this entry through the RSS 2.0 feed. You can leave a response, or trackback from your own site.